One thing to know when reading a SPA review is that unless you’re a trained expert, working in the spa industry and knowing everything about special treatments, a review will always be highly subjective. 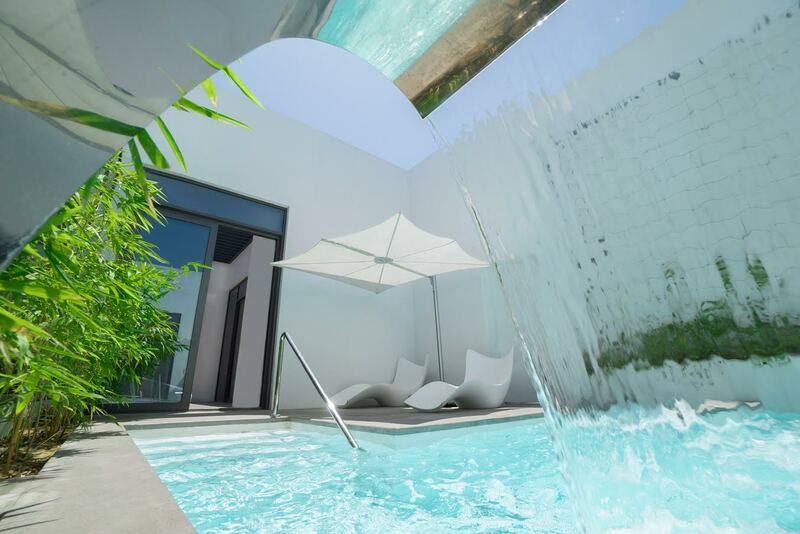 I never try to find the best SPA – because let’s face it: I haven’t found a bad one in Dubai and I don’t think I will – and it is all about preference. What ambience do you like, what kind of products or treatments are you looking for, do you want to have a couples treatment, what price range is most suitable to your budget? I can go on and on. With That Luxurious Feeling all I want to present is products or experiences that clearly fit that scope and to me, luxury is not about money; it is about a state of mind and when everything just feels right. For those of you who follows TLF on Instagram there’s no secret that I love Nikki. I’ve got a couple of hideaways in the city that I love and this place will forever feel like home away from home. 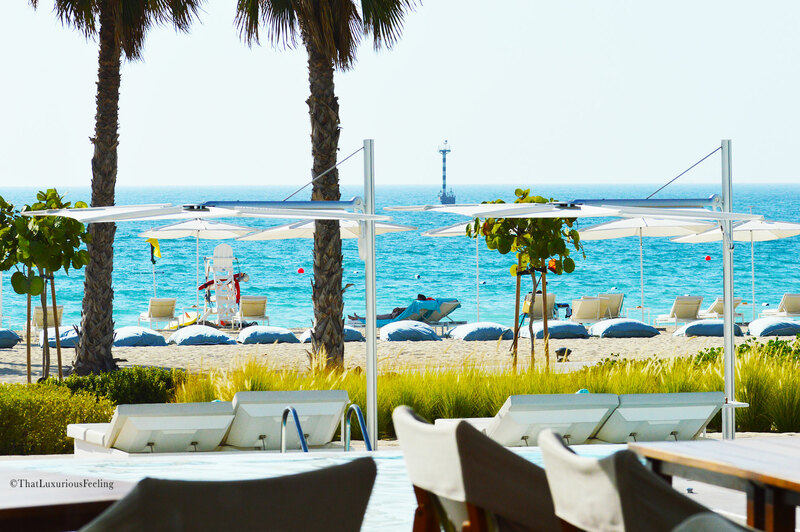 For most people I think that when they hear Nikki Beach they immediately associate it with the famous beach clubs! If you’re looking for party, sun and fun, the club is the right place to be! However, the “hidden treasure” for me is Nikki Beach Resort & SPA, located on the same private half-island as the club. 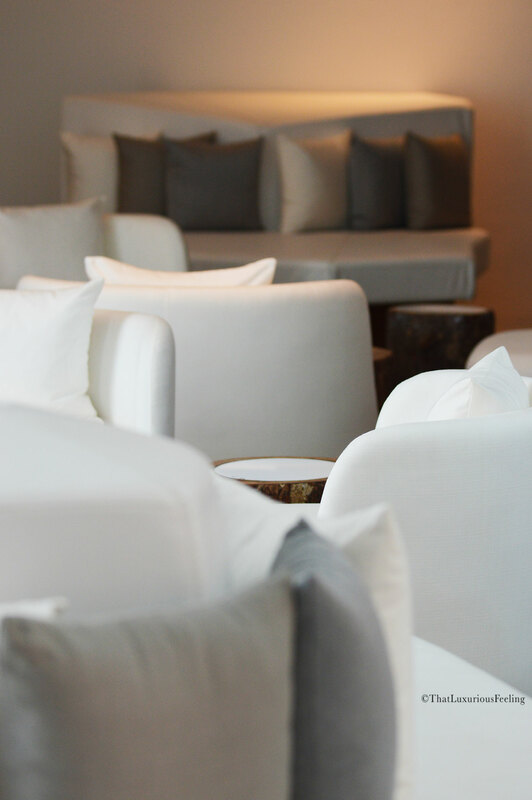 Here, it is all about relaxation, chilled out days and evenings, good food, the possibility to actually hear the ocean and fantastic service. It is the place I go to when I want to read a book, work on my articles, have a drink and pamper myself with healthy, fresh organic food. And now, the Nikki SPA is finally open! 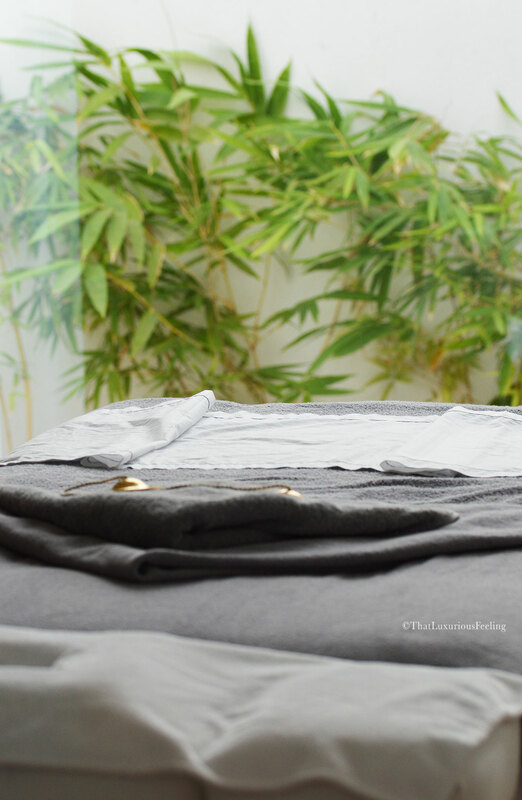 Hubby and I had the pleasure of being invited to try one of their couples treatments and of course I need to tell you all about it. In true Nikki style: #tellonlyyourbestfriends. First of all: the architecture. My Scandinavian heart beats faster everytime I enter the driveway of the hotel (top photo). 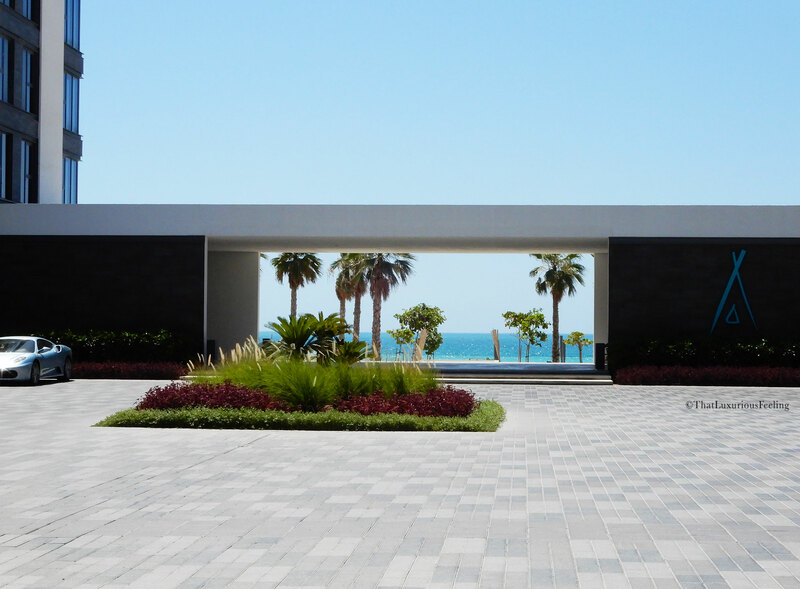 All you can see is straight out into the ocean and the whole building is a masterpiece of sleek, contemporary design. All glistering in white, furnitures and decorations in basic natural materials and soft colours I can’t say how much it pleases me with straight lines and clean design. When you enter Nikki you get the feeling that you could be anywhere in the world. It is free from an overwhelming arabic touch (there are other places to visit in Dubai if you like that design) The materials and colours – even the staff wears super casual chinos and shirts, looking like a Brooks Brothers Beach Commercial – makes your eyes and brain relax. This a place where you’re welcome in your casual clothes. It is simply welcoming. The same goes for Nikki SPA. If I had a large garden, I’d like it to be designed just like the entrance to the SPA: all white and clear, with a lot of turquoise water and green elements. It makes you feel good even before entering the reception! The reception area is decorated as a chic lounge and this is where we got to sit down, take a deep breath and start our journey. First, we got to fill in the consultation forms. It is standard procedure but for me, having some health issues, it is crucial to get the chance of showing the therapist where my boundaries are. While filling in the forms, the kind receptionist handed us a drinks menu: we where offered a hot or cold beverage together with a hot and cold flannel! I really liked this welcoming touch. Hubby went for a cold drink and I decided I needed a hot tea. 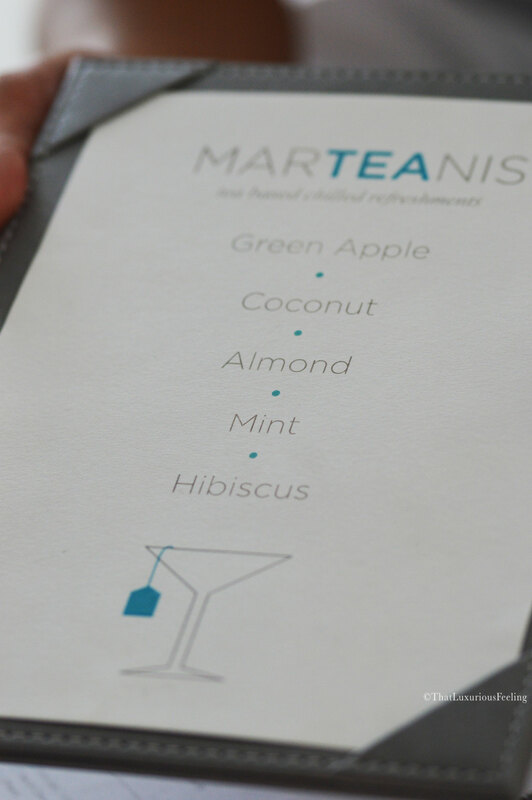 Sitting there, sipping on our drinks, we where presented of the different treatment options available. Yes, this is was a couples treatment but still, you’re allowed to choose your personal experience. Such a classy and considerate touch, as we have different bodies and needs. It is always interesting whenever we go together on treatments like this, because while my husband is completely new to the whole scene and the idea of spending time and money spaing, I have a problem with knowing too much! No one likes a know-it-all hahaha, sometimes it is hard to know if I shall review things from a new customer’s point of view (like hubby) or through the Beauty Editor glasses that I’m always wearing. 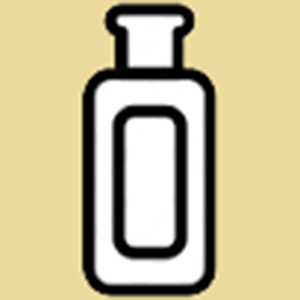 While I immediately knew what treatment I wanted to have: the Aromatherapy massage; my husband looked utterly confused at all of the alternatives. In the end, he decided to go for the deep tissue massage to release some tensions. Well needed. 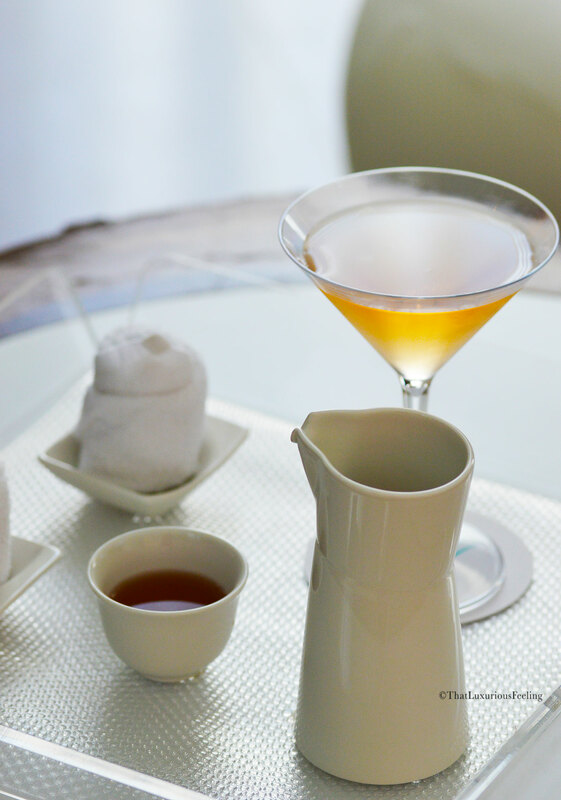 In our greeting email from the SPA, we where told to arrive at least 45 minutes prior to our scheduled treatment to have the opportunity to enjoy all of the amazing facilities. 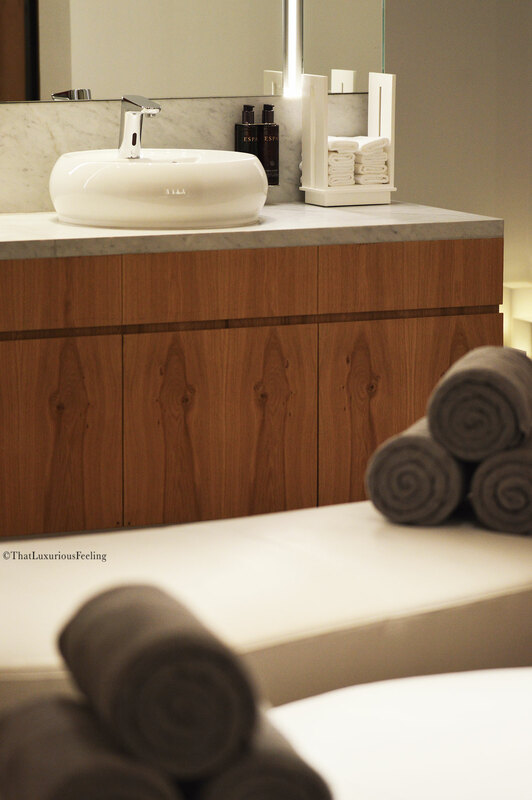 The SPA is designed like a large rectangular, one side for all the male facilities and the other side for us ladies. 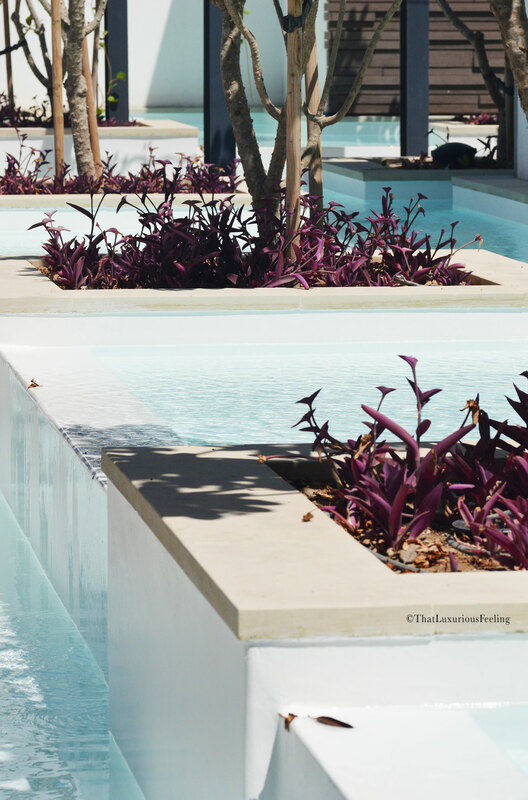 In the middle, the breathtaking vitality pool, where both men and women have access, is resting. I simply enjoy the area. Disposable underwear, the thickest and plushest bathrobe in town, slippers and of course my favourite ESPA London products all over the place. I can’t begin to tell you how happy I am to find these products in the SPA. 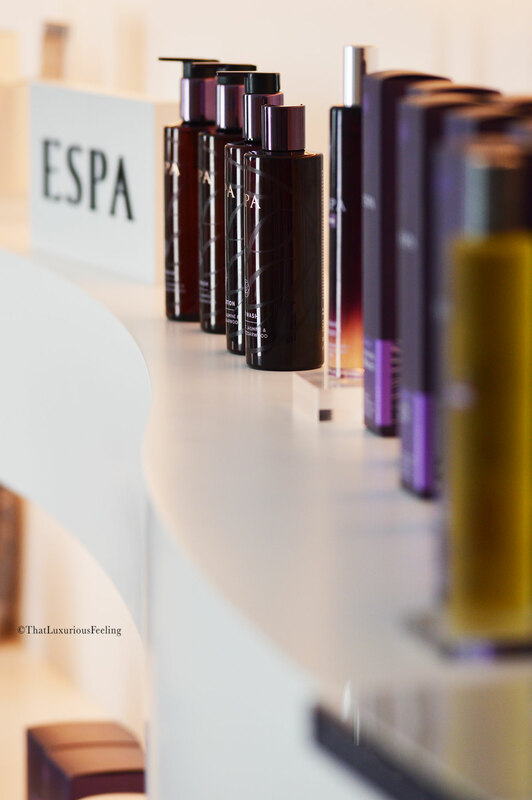 ESPA has such long time experience in the industry, they are well known and respected, so it is wonderful to see Nikki only choosing the best of the best! 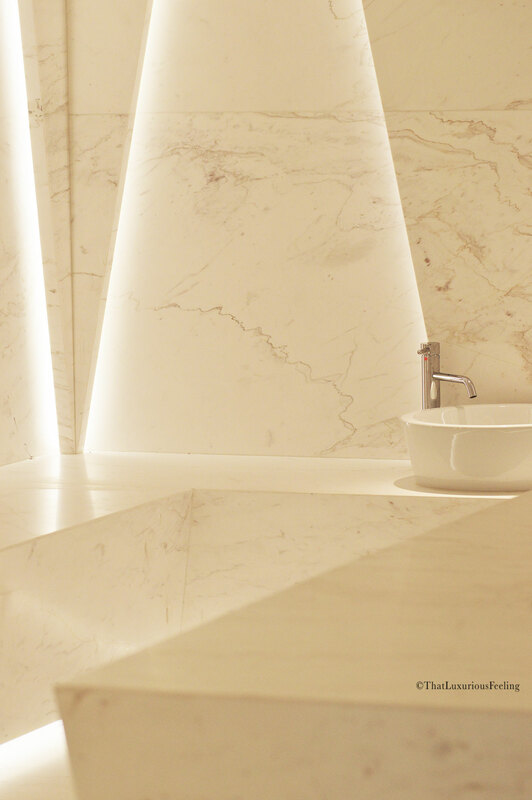 The female area is identical with the male ones, with private changing rooms for discretion and really luxurious vanity tables with things you might be needing. They areas both hold a regular sauna chamber and a steam room. The design of them are very sleek and immaculate. Normally, we would have loved to meet at the vitality pool but sadly, it was closed for maintenance on the day of our treatment, so we ended up spending our 45 minutes separate; hubby steaming away with joy and I enjoying the relaxation room where I could sit and look over the garden, listen to music, do some Insta Stories (!) and pamper myself with cold beverages and a healthy nut-mix. All while lounging in my bathrobe while contemplating how to steal it without anyone noticing :). I will be completely honest with you: the idea of a couples treatment is great but with some of the restrictions that comes with this part of the world, I felt a little bit lonely without my husband. When the therapist came to get me for the treatment and we got to reunite in the couples suite, I think we both felt a lot more relaxed. First of all: let’s talk about the beds! These are the “Rolls Royce” of massage beds, German engineered (the brand is called Gharieni) they are divine. They have the highest quality of hydraulic couches, integrated heating elements so you never feel cold during your treatment, with both the arm- and the head resting parts adjustable. To me, with some of my back issues, this is the game changer. It is very hard for me to lie flat on a straight bed for over an hour, but with the support these beds are offering for your neck, for the face when you’re on your front and for the arms it made all the difference. Obviously, the beds where also dressed in the thickest of french luxury linen, making the whole experience feel like your crawling onto a hotel bed and not a treatment table. It relaxes you and makes you feel human and happy. It’s in the details. 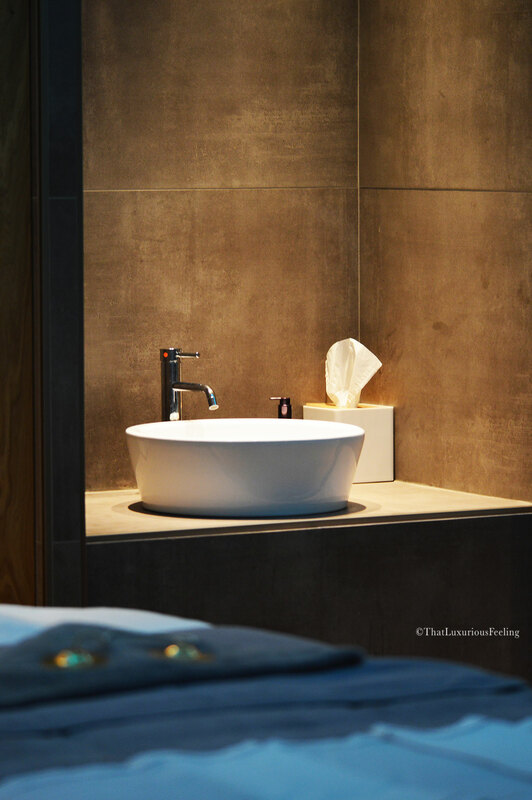 The suite has its own bathroom facilities and what we both liked with it was the size: it was large and clean, the therapists could easily move around and the lighting system allowed for four different lights – all to make us completely comfortable! For the treatment itself, all we could both say is that is was top notch. 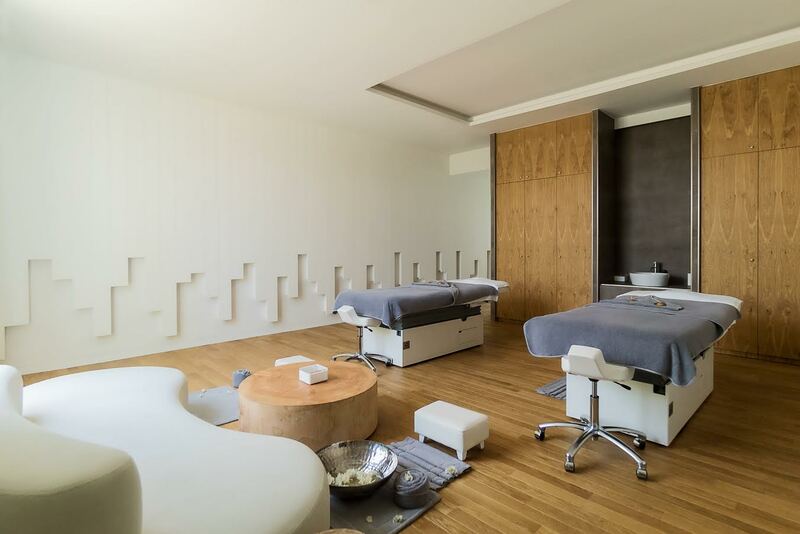 We knew beforehand about the SPAs dedication to result driven hand movements and products, we knew that the therapists are well educated and experienced in their professions and it was noticeable. The whole procedure was like putting our bodies into full relaxation. Not once did the therapists get interrupted, missed a beat or moved around while making noises. The flow to their treatments was something we discussed on our way back home. It was almost like they where dancing! It might have been courtesy of the amazing music that filled the room, once again all Nikki handpicked, but the whole experience was so calming, that my hubby actually fell asleep during a deep tissue massage! Yeah, I could hear him snoring away, hahaha. It was cozy to know we were in the same room even though we didn’t share a word during the whole treatment; we got lost in our separate bubbles of tension relieving and aromatherapy. Not too bad for a weekday pampering! 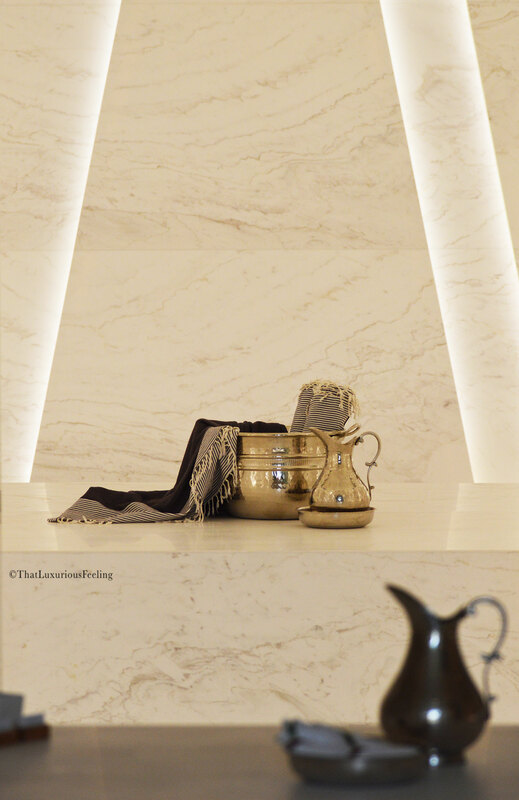 Although we didn’t have the chance to try it out, I must also show you the oh-so-beautiful Hammam Chamber! 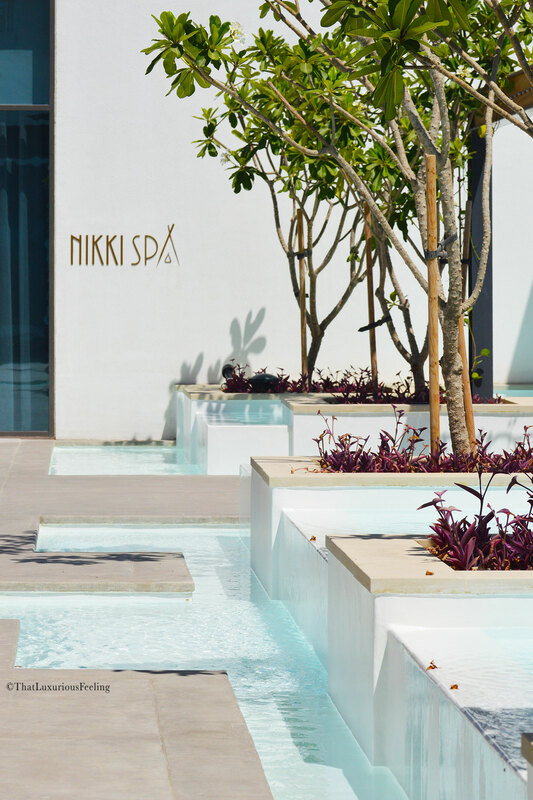 If you ever want to take your friends out for a nice day, I suggest you go to Nikki SPA for the Hammam experience followed by a light lunch overlooking the ocean. This is what luxury is all about. You walk in stressed and tired and you leave with an open mind and relaxed shoulders. 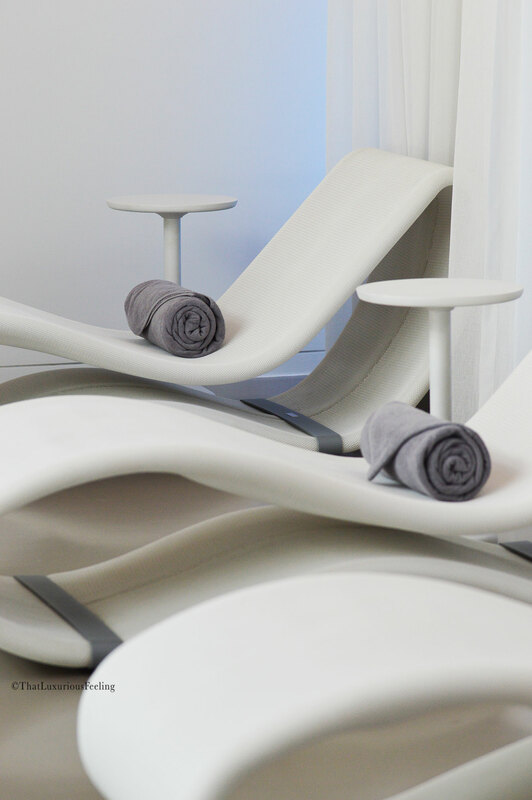 The visual effect of the whole spa plays an important role in how you perceive it. It is breathtakingly chic. As the Vitality Pool was not working, we where kindly offered to use the fantastic pool area of the hotel. I would have loved to stay there for the whole day, but we decided that it was simply too hot outside (Dubai in June is interesting) for a pool day. Instead, we just wanted to have lunch in the restaurant, overlooking the pool and private beach. It might be my favourite spot in Dubai. The food is excellent and the view…the view! Treatment provided for review consideration. Thank you for sharing these beautiful photographs and detailed article about your experience. Feeling a little envious and in need of visiting this Incredible spa in the future. What a wonderful place. Could this be my excuse to visit Dubai at last?